The Toy Foxton is not a purebred dog. 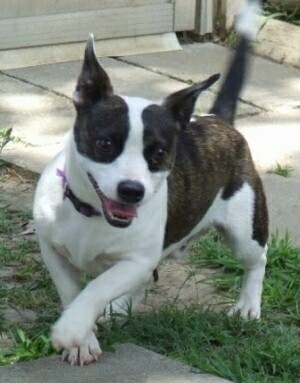 It is a cross between theBoston Terrier and the Toy Fox Terrier. The best way to determine the temperament of a mixed breed is to look up all breeds in the cross and know you can get any combination of any of the characteristics found in either breed. Not all of these designer hybrid dogs being bred are 50% purebred to 50% purebred. It is very common for breeders to breed multi-generation crosses. "This is my little Brenley. 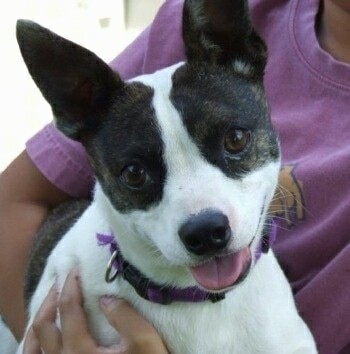 She is a Boston Terrier / Toy Fox Terrier hybrid. Brenley is 10 months old in these pictures. She is so fun to play with. Her favorite toy is a small, squeaky tennis ball. She will throw the ball around with her mouth and run and get it. It is amazing to watch. She is the perfect travel dog; I take her everywhere. She is a very balanced dog. I've not had any issues with her. She is so smart and has been so easy to potty train, to sit and lay, to come when I call her the first time. She hardly ever barks. Brenley is the most loyal dog I've ever had. She is perfect. She gets along well with other dogs and she loves to lick cats. She is such a little mother." "Brenley has a smooth coat. She does shed, but not badly. 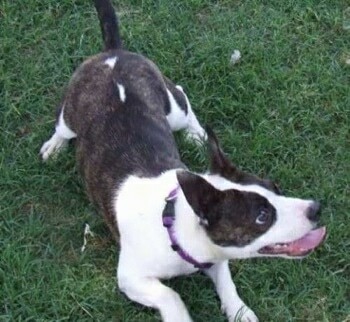 She is white and brown brindle. I watch Cesar Millan all the time. His techniques are great. Everything I've tried has always worked with Brenley and my other dogs." 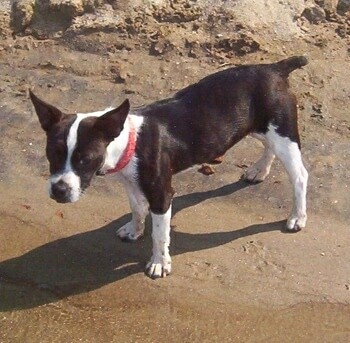 Harley the Toy Foxton (Boston Terrier / Toy Fox Terrier mix breed) as a puppy at 10 ½ weeks old and 4 pounds. He has his toy around his neck.